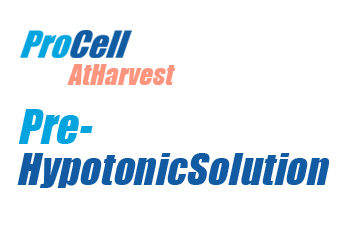 Pre-Hypotonic Solutionis to be used before the hypotonic stage of a blood or bone marrow harvest. Pre-hypotonic Solution makes the hypotonic step more effective by circumventing the tendency of chromosomes to clump or to under-spread. The clumping of metaphases during the harvesting procedure often results in the loss of useful metaphases or the loss of entire cultures. Procedures such as FISH that require good well spread metaphases are often hampered by this problem. Pre-Hypotonic Solution was developed to address this clumping problem. Optimal metaphase swelling can therefore subsequently be achieved by your hypotonic solution. Pre-Hypotonic Solution was developed to address this clumping problem. 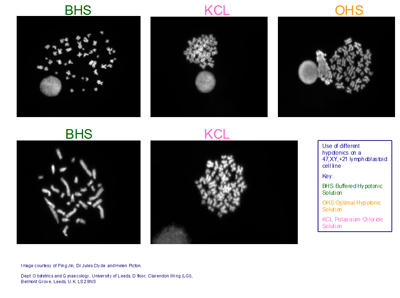 Optimal metaphase swelling can therefore subsequently be achieved by your hypotonic solution. Pre-Hypotonic Solution has been found to be particularly useful for template CGH metaphases. CGH hybridisations have been improved by Pre-Hypotonic Solution. 1. After colchicine/colcemid/Metaphase Arresting Solution incubation is complete, spin down the culture discarding the supernatant. 2. Mix the cell pellet well and add 10 ml of culture media, followed by 1 ml of Pre Hypotonic Solution. Mix well. 4. Discard the supernatant; proceed with the harvest as normal from, and including, the hypotonic step. 1. Pipette out the old medium. 2. Add 10mls of fresh medium, followed by 1ml of prehypotonic. 4. Pipette out the prehypotonic.